.. And by silliest I mean freakin’ awesome. 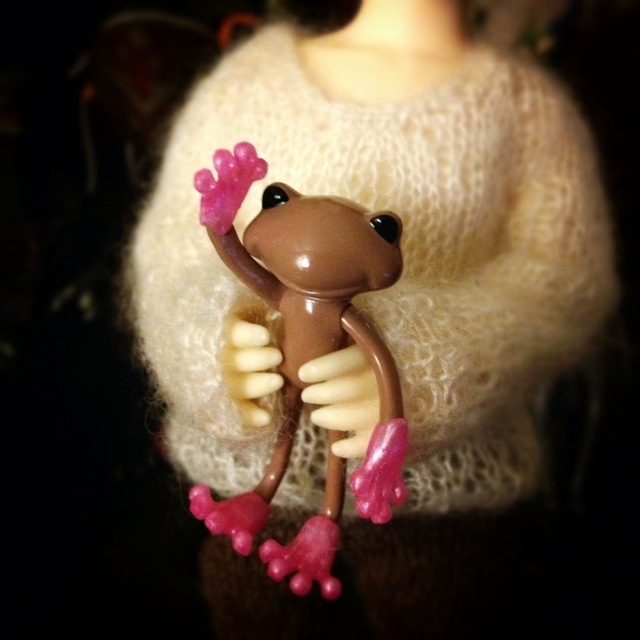 Hugo got himself a set of hands and feet from Aterlier Matin on etsy. Myint is so jealous. But seriously, I raced to my computer as soon as items were being listed. I wanted to get a set for my big Wanda frog but sadly no luck (so many things were gone in seconds). Well worth the silly stress. These things crack me up so much. I uploaded a calendar app on my phone that keeps track of photos I take for instagram. I decided to do a challenge this month and take a doll photo a day to fill the calendar up. I’ll share them here as well. So lucky you. You get to see all of my quality phone photos. I rarely, if never do seasonal knits. I wanted to get into the autumn season spirit (or at least the Halloween spirit) this year. Have fun and play with autumn color… Because I do have quite a bit of it in my mohair stash and I do love them. So here is the first two in several that I will be offering starting tomorrow night. 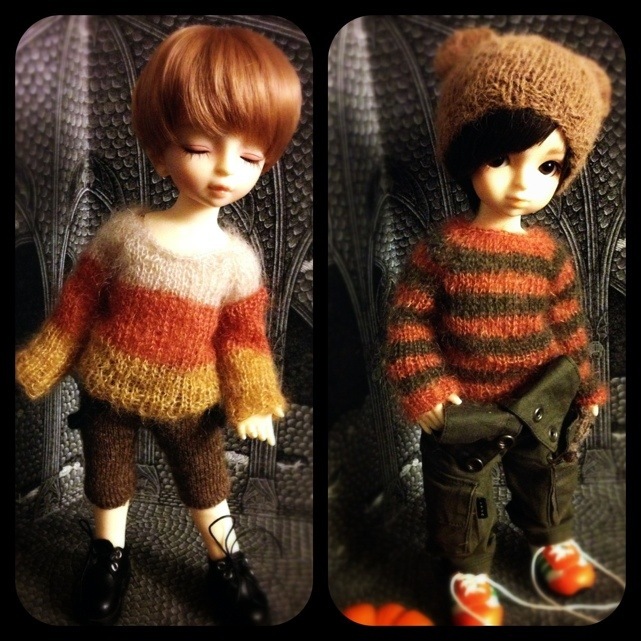 Haru in “Candy Corn” and Tsuyoshi in “Pumpkin Patch”. Fun, right? … Okay, well, at least making them was. Btw, like the background? Yay for Amu being a collecting pack rat. I just happened to have stumbled upon an Edward Gorey Toy Theature set to Dracula boxed away. I don’t even remember buying it. It’s pretty much paper craft to the story. The Yos just barely fit in the rooms but the Mr got some amazing shots for the shop update (not pictured above). I should put the whole thing together for Halloween.